The master bedroom is always the largest bedroom in the house. It is the room where mom and dad stay. Its size varies from one house to another. There are many style designs of master bedrooms such as contemporary, traditional, ultra-modern, etc. The style designs of master bedrooms depends on two main basic factors which are the interior of the house and the requirements of the individual. Interior designers pay special attention to both quality and details of bedroom designs. The general trend is to have the same hues of color for wall painting, ceiling and floor. In the future design of bedrooms, we can have a steel bed and pieces of furniture becoming closer to one another, fluorescent lighting, colored carpet and unconventionally modern and stylish ceiling. Master bedrooms that enjoy moderate and up to date styles can facilitate life for people who are busy with their work. The first design for a minimalist bedroom is composed of elegant white bed, moderate pieces of furniture in contrast with dark wall painting. The second design is a contemporary one with a strikingly different lighting. 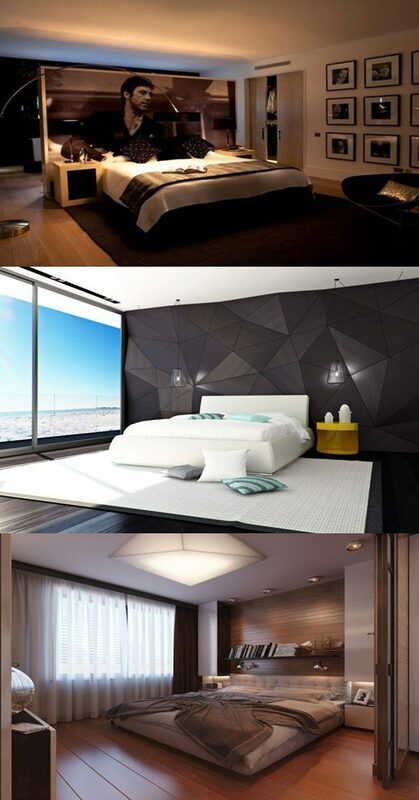 Lights are on wall panels, furniture and on the bed which has a staircase. The bedroom appears comfortable and splendid. Choose colors such as oranges, reds, pinks, and warm yellows if your bedrooms have little or no direct sunlight. Blues and greens are chosen for sunny rooms. Wash your windows carefully. Get rid of the old curtains, and replace them with new ones that match the color of the room. Use different shapes and sizes of colorful and garnished pillows to decorate your bed and to add life to it. You can choose either to have a warm light by using a lower wattage light bulb or amend your lights and fans either by using traditional or contemporary designs.